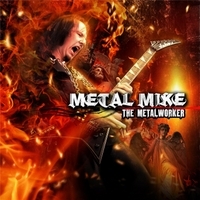 Here's the long awaited solo album from Metal Mike. Incredible release with superb songs, machine precision technique and seriously shredding guitars. This album is a testament to unbending and true Heavy Metal that is played loud and proud. Featuring vocal siren Carlos Zema - Vocals (Immortal Guardian, Outworld), Mike LePond - Bass (Symphony X) and Kevin Talley - Drums (Daath, Six Feet Under). This is serious Metal. This Cd comes signed by Metal Mike.